Selecting an angle for your knife edge is an important first step in sharpening. Selecting an angle is probably one of the easiest steps in sharpening, once you know the basics. To make it easy, a 20 degree bevel angle is a good starting point. If properly sharpened, the 20 degree angle will work well for most knives. If you're concerned about getting more performance from your knife you can fine tune the bevel angle to meet the specific needs of your knife. 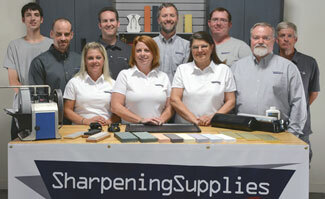 Sharpness and durability are the two factors when deciding on a sharpening bevel angle. The lower the angle the sharper it becomes, but it also becomes less durable and more prone to chipping. If you seek a very durable edge, a larger angle is preferred because it can withstand more than the thinner edge of a low bevel angle. The angle you choose is a matter of personal preference. We've developed this chart as a starting point for your knives and other bladed tools. Questions about knife sharpening angles?